I can’t begin to tell you how excited I am to have been given the opportunity to review The Cookie Dough Lover’s Cookbook, by Lindsay Landis (of Love and Olive Oil Fame). I have been a fan of Lindsay’s for ages, and from the minute I picked up this book I was amazed by her creativity and ideas. I loved this cookbook from the moment I picked it up. Before I even read any of the recipes, I noticed that the pictures (all taken by Lindsay herself- speak of talented!) are unbelievably eye-catching and drool-inducing. It’s hard to look at this cookbook when you’re on a diet (trust me, I had to do it!) because you will want to make every single thing in it. And you won’t like not being able to taste any of it. Regarding the recipes, the first thing I noticed was how amazingly versatile this cookbook is. You’d think that when limiting your recipes to cookie dough-centric ones, you won’t have much of a variety. Well, if you are skeptical, this cookbook will prove you wrong. Lindsay goes where nobody has gone before, putting cookie dough into things that most of us can only gape at open-mouthed. Cookie dough creme brulee? I wouldn’t have thought of it, but count me in! Once you start reading, you notice that quite different from the dry and contrived introductions in some cookbooks, Lindsay injects humor into the introductions, giving you just one more reason to start baking immediately. As I mentioned before, this cookbook has absolutely beautiful pictures. However, as a very visual person, I particularly appreciated that every recipe in this book has a picture. A gorgeous picture that helps you see exactly what you are getting yourself into. I also love that the cookbook has recipes for all occasions. 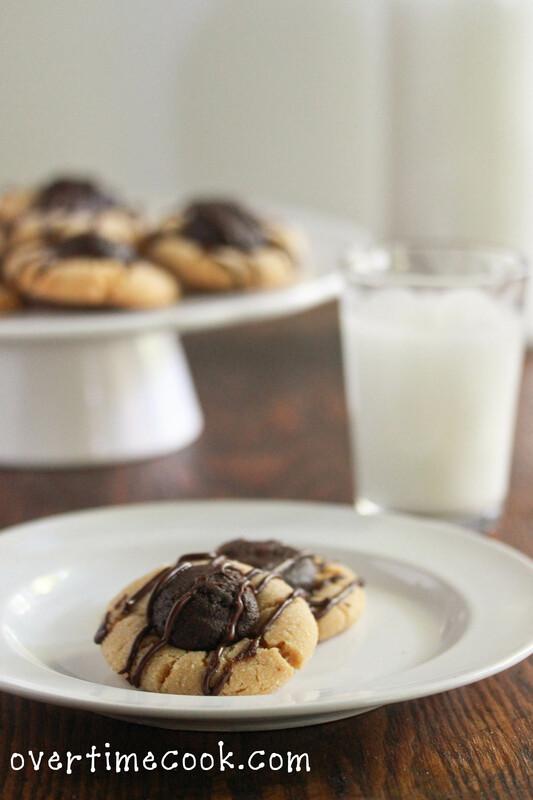 Again, when every recipe includes cookie dough, you might not expect fancy desserts for special occasions, but treats like the aforementioned creme brulee and chocolate cookie dough tarts are beautiful and definitely worthy of special occasions. Another thing I loved about this cookbook was the variety of cookie dough flavors. Sure, we all think of chocolate chip cookie dough first, but I sure won’t say no to peanut butter cookie dough, sugar cookie dough, or other great flavors that Lindsay includes in her book. Soft Sugar cookies with cookie dough frosting: These look like those amazing soft sugar cookies you see all over the internet, except the frosting isn’t some plain old boring pastel colored concoction, but it’s actually made out of cookie dough. Of course. Cookie Dough Stuffed Chocolate Cupcakes: Does this even need an explanation? Chocolate Cupcakes. Filled with cookie dough. Heaven help me and my dieting soul. Invisible Cookie Dough Ice Pops: it’s summer and cookie dough turns into an ice pop. You know you want that. Chocolate chip cookie dough balls: they’re the recipe that inspired the book. You know they have to be super awesome. Obviously, anyone who loves cookie dough. More specifically, anyone who loves cookie dough and wants to make some awesome desserts which incorporate cookie dough into them. Anyone who doesn’t love cookie dough. Do such people even exist? Also, anyone who is looking for an all around dessert cookbook for general purpose use will not find what they are looking for in this cookbook. Lastly, anyone who is on a diet should stay far away from this cookbook. Or torture yourself. Either way, this book doesn’t contain diet-friendly recipes. Like I said, I love this cookbook. My main complaint about it is not about this cookbook in particular, but any highly focused cookbook like this one. 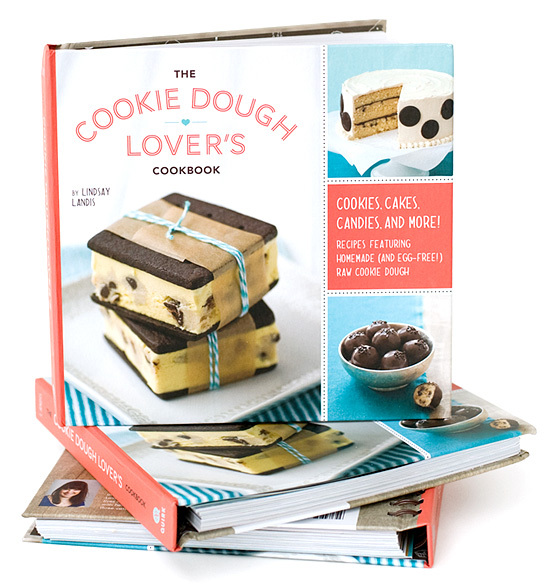 While this cookbook features an unbelievable array of cookie dough desserts, at the end of the day, they are all cookie dough. As amazing as they are, they do seem to run together in my head after a while. I think the only other real complaint I have about this is in the nature of the cookbook. Being that many of these recipes require cookie dough to be made in addition to the other parts of the recipe, there is often a totally extra step to the recipes. Worth it, but extra. The only other (very small) issue I have is that there are some recipes that use special equipment like a candy thermometer that some people don’t have. Again, it’s a small issue, as most recipes don’t require anything special to make them. My final issue with this book is, as I mentioned, there’s nothing remotely dietetic in it. Honestly, I completely expected that from a dessert cookbook, but thought I would throw this out there. This is an incredibly innovative and gorgeous cookbook, with recipes that look amazing and taste better. Anyone with a special place in their heart for cookie dough really needs to own this book. Disclaimer: I was provided a review copy of this cookbook at no charge. Opinions are my own. In a large mixing bowl, beat together the peanut butter, butter/margarine and sugars until light and fluffy, about 1-2 minutes. Beat in the egg and vanilla and beat to combine. Slowly add the flour, baking soda and salt. Mix until ingredients are just incorporated. Roll 1 inch balls of dough into the remaining 1/4 cup sugar until evenly coated. Place on cookie sheets about 2 inches apart from each other. Using your thumb or the back of a teaspoon, make a small indentation in the cookie. Bake for 10-12 minutes or until set. Let cool for one minute, then further define the indentation with the back of a spoon. Transfer cookies to a cookie sheet to cool completely. Beat together the peanut butter, butter or margarine and sugar in a large bowl until light and fluffy. Mix in flour, cocoa powder and salt on low speed. Add the cream and vanilla and beat until incorporated. Stir in chocolate chips. Drop a teaspoon of dough onto the center of the cooled cookies, then smooth the top into a dome and press in slightly to adhere to the cookie. 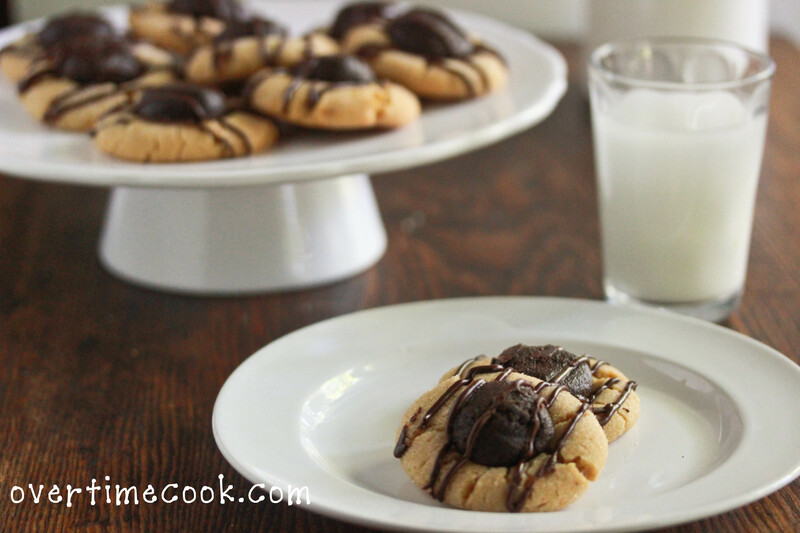 If desired, drizzle melted chocolate over the finished cookies. So this is probably the third blog I’ve read which has mentioned this cookbook, all of which look amazing… I’ve already caved and bought it (although not yet available in the UK, had it shipped to my mum and dad). I think you’re right, it will best be used in small doses, widely apart, to get my cookie dough fix! These remind me of shtreimel cookies! They look so perfect and yummy. Haha, funny that you say that because I am DYING to find a recipe for homemade streimel cookies. These may look similar, but they’re completely different. Wow, these cookies look perfect!!! Nicely done, Miriam. Great photography too. Foodgawker much?!? These look delish! Stunning photography to boot! I always enjoy your cookbook reviews and this one is no exception. Well done Miriam and your thumbprint cookies look wonderful. Also, I really need this cookbook in my life, haha. These look great! I can’t wait to get my copy! This looks out of this world. I don’t think there is any way to improve these, YUM! Oh my, these look amazing! I love it when cookbooks have a photo for every recipe too. Can’t wait to make these they look great! I love PB and cookie dough! Wow, these look amazing! 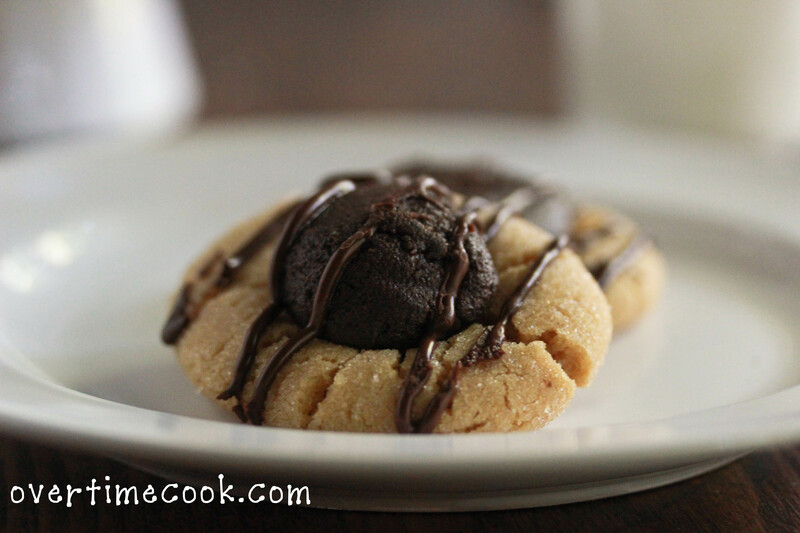 Can’t wait to make them, I love PB and cookie dough! I like cookbooks with a picture for every recipe too. I have that cookbook but have yet to make anything from it. I need to stop stalling! A must bake! These look to die for. A definite treat though….how do I stop from makings them regularly?!!! these look amazing and super yummy!! any way to sub out whip/ cream?